In living memory a common feature in Scotland’s towns and cities, cinemas are now an increasingly rare part of our streetscapes. Constructed in a variety of engaging and exuberant styles, they add much to our country’s rich built heritage. A new image of the restored frontage of the Britannia Panopticon Music Hall in Glasgow has been added, with details about the restoration work, thanks to Euan Adamson & the Britannia Panopticon Music Hall Trust. A new gallery of interior pictures of the Rex, Lockerbie has been added, thanks to Murray Thomson and Sam Hayward. Better images inside and out of the Playhouse in Galashiels are now online, thanks to manager Andrew Poole. New pages for Biggar, Coalburn, Kilsyth and Lochmaben, plus interior shots of the Town Halls in Airdrie and Darvel have been added, thanks to Harry Rigby. He's also kindly provided images of the inside and outside of the former Cinema, Glenboig. A planning application has been submitted to demolish the 1913 Picture House in Cumnock, to replace it with a car park. The bingo in the former George cinema in Girvan has closed, and the building is up for sale. An image of the frontage of the Coliseum, hidden behind metal cladding for 30+ years and very briefly revealed during the demolition works, has been added thanks to Steven Parkes. The BBC News website has a feature on the possible re-birth of the Leith Theatre here. The demolition of the Glasgow Coliseum is now all but complete; a gallery of demolition images can be found here. The cinema has therefore been moved into the Demolished section of the Glasgow Cinemas index. Today's Evening Times features a piece on the demolition and history of the building, including quotes from ScottishCinemas.org. Further coverage of the Edinburgh Odeon call-in decision was in the Scotsman here, the Evening News here, and was also featured on Forth FM. The actual official 'call-in' notification from Historic Scotland to the council can be seen on the council planning website here. The Guardian newspaper is asking for comments and votes on people's favourite cinemas for a forthcoming series of articles - more details here. The former Miner's Welfare Hall / Randolph cinema in Stirling has been demolished, according to information from Murray Thomson. The Evening Times reports that one of a number of Townscape regeneration bids involves purchasing the former Olympia in Bridgeton for use as a sporting or events venue. Tilda Swinton leads the chain gang pulling mobile cinema across Scotland - details here. A new campaign to return cinema to the town of Paisley has sprung up - details on the Paisley Film Society website here. Historic Scotland has announced that the planning application to demolish the auditorium of the former Odeon Edinburgh has been 'called in' for determination by the Scottish Ministers. This is a highly unusual step that is only taken for less than a handful of listed building planning applications each year. The statement from Historic Scotland is here, and there is coverage of the call-in on the BBC News website here. Planning permission has been granted for the conversion of the former Birks cinema, Aberfeldy, from a derelict amusement arcade to a cafe bar and single-screen cinema. The plan is being mooted by the 'Friends of the Birks', who are hoping to see cinema return to the town. The AGM of the Friends is on Thursday; details here. South Ayrshire Council have started the process of looking for tenders for new owners for the Gaiety Theatre in the Ayr. Details here. The demolition of the Glasgow Coliseum continues, with most of the stage end now gone. Updated gallery of pictures here. Glasgow's former Coliseum / Cinerama theatre suffered a serious fire in the early hours of Monday 25th May, after which the roof is all but gone, the top of the tower has collapsed, and the side walls are bulging. The future for the building does not look good at this point. Gallery of post-fire images here, plus press coverage on the BBC News website here, the Evening Times here, here and here, and the Scotsman here. 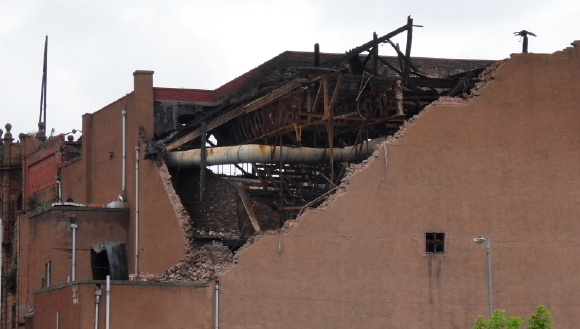 The Urban Glasgow forum has some images looking into the fire-ravaged building here. 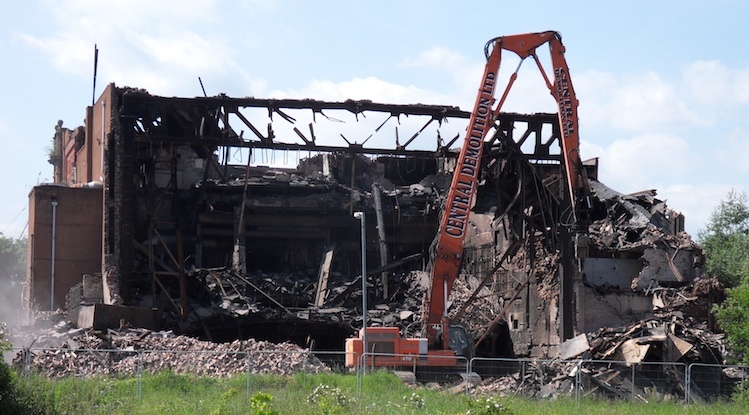 As of this afternoon, some demolition work had started at the former stage end of the building (pictured above). The campaign to convince Historic Scotland to call in the planning application for the former Odeon Edinburgh Clerk Street continues; the petition is at over 5,100 signatures, the press coverage continues, and a report released under the FOI has raised hopes that an inquiry might forthcoming. The Nemesis Republic blog has also covered the ongoing saga. Coverage of the Glasgow Film Theatre's 70th birthday was featured on the BBC News website here. Demolition works at the Grange, Stevenston are due to start within the next few weeks. The former Roxy in Kelso is now an Italian restaurant; the website for it is here. Thanks to David Baker, Stephen Elliot, Neil Darlington, David Low, & Andy Wilson, for other information and updates. The Scotsman has run a piece on an open letter calling on Historic Scotland to call the Edinburgh Odeon planning application in for a public enquiry; details here, and a follow up selection of reader letters on the subject can be seen here. Other Press Coverage includes Trainspotting star Ewan Bremner supporting the campaign here and here and the EdinburghGuide.com here. The online petition is up to 4191 signatures. Coverage of the Historic Scotland booklet on cinemas is here and here. The Glasgow Film Theatre is celebrating its 70th birthday on May 10th; they're looking for votes as to a film from 1939 (when it first opened as the Cosmo), and from 1974 (when it became the GFT) to show at its birthday bash. You can vote here. (Voting closes May 1st). There's a film showing of Slumdog Millionaire on May 3rd at 2.30pm at the refurbished Alhambra Dunfermline theatre - a chance to see a film in this building that was a cinema for most of its life. Details on the Alhambra website here. The same website also has a great gallery of up to date interior images here. A new website to photographically archive the dead and/or dying cinemas of Southeast Asia has been launched; visit it at The Southeast Asia Movie Theater Project. Coverage of the re-opening of the Bo'Ness Hippodrome can be found in The Times here, and the BBC News website here, plus some video of the interior then and now here. The petition to try to save the former New Victoria/Odeon in Edinburgh now has over 2,300 signatures, having been running for less than a week. Some coverage in the Edinburgh Evening News here. The celebration of the Panopticon’s immense history of Comedy as the oldest music hall will continue with a fundraising Gala Show in Oran Mor on 29th March. This show marks the end of Magners Glasgow International Comedy Festival and celebrates the history of music hall with a 3 course dinner and 3 courses of entertainment. A petition has been launched to try to save the former New Victoria/Odeon in Edinburgh. Details on the GoPetition website here. Some new interior images of the Britannia Panopticon, on the occasion of Tony Roper unveiling a collection of theatre images, have been added; images thanks to Jenny Bann. In addition, we have a new gallery of some stunning interiors of the Cameo, Edinburgh on its 60th Birthday weekend. Better old postcard images of the Odeon, Ayr have been added, thanks to Kevin Phelan. Thanks to Bill Mather, former owner of the WMR (George) in Irvine, we have some great photos of that cinema in 1983 and the re-opening night programme, plus exterior and interiors of the Classic (Cranston's de Luxe) in Renfield Street, Glasgow. More stunning images from 'dusashenka' - be sure to visit his Flickr page to see the original high-resolution versions of all of these great images. The Bank and Empire in Clydebank, the ABC and Plaza in Dundee, the ABC Regal and Lyceum in Edinburgh, ABC Regal in Falkirk, the ABC Regal in Greenock, the ABC Regal in Kilmarnock, and the ABC Regal in Kirkcaldy. Plus, in Glasgow, the Norwood / George, the Govanhill Picture House, the Princes, Springburn, the Olympia, Bridgeton and the Picture House, Dennistoun. A fantastic gallery by Miss Mass of the interior of the 1912 Bo'Ness Hippodrome, all ready for its grand re-opening as a cinema next month, can be seen on Flickr here. King's Theatre, Edinburgh gets £500,000 Historic Scotland grant - details here. Steven Elliott has kindly provided us with a gallery of recent images of the interior of the Grange in Stevenston, which has closed to bingo and is shortly to be demolished. Thanks to George Millar, we have two fantastic posters advertising shows at the Regal, Macduff, and the Picture House, Banff. Rare archive images of the interior of the Palace, Aberdeen, have been added, many thanks to Alan Rennie [via Jim Brooks]. Interiors of the C-listed Savoy, Cambuslang have been added, just before it is due to be converted to a Wetherspoons bar. Many thanks to Chris Bradley for the images. A recent colour image of the La Scala Dunoon has been added, thanks to Sam Haward. A new archive image of the Argosy, Aberdeen has also been added. The Hippodrome in Bo'Ness is due to re-open as a cinema at the start of April; details on the BBC News website here, and the Press and Journal here. The bingo in the former Picture House in Cumnock has closed, and the building is up for sale; the sales particulars say it is in a poor state, and likely to be demolished. The Paisley Daily Express has a write-up about the Regal demolition here. A new website, Scotland's Images, brings together pictures from a variety of national collections. A new partnership between Scottish Screen and Glasgow Museums has resulted in the launch of the Reel Lives website. The Scotsman has a nice long article on the Britannia Panopticon Music Hall in Glasgow, and its latest fund-raising efforts, here. An ongoing project to record all of the films shown at the Edinburgh Odeon/New Victoria is now online here. The former Strond cinema in Orkney is now an Arts Centre; details on its website here. An options appraisal study to determine new uses for the former Leith Theatre is to be carried out, according to EdinburghArchitecture. The 1914 B-listed former Lyric in Ardrossan is covered in scaffolding, as its auditorium is to be demolished and the facade retained as the building is converted to flats. Details here. A picture of the staff of the former Cinema de Luxe in Denny in 1969 can be seen on the Falkirk Herald site here. The former Parade in Dennistoun would appear to be in a precarious state, going by these flickr images. STV reports that the Odeon Dunfermline is to have a screen fitted out for 3D films. Plans to dramatically rebuild the Theatre Royal in Dumfries are being reconsidered; details here. Former projectionist Gordon McTavish is hoping to find murals in the former Palace in Huntly, before it is due to be demolished. Details in the Press and Journal. The former New Bedford in Glasgow, until recently the Carling Academy music venue, has been rebranded as the O2 Academy. Similarly, the Picture House in the former Caley in Edinburgh is now the HMV Picture House. The Perthshire Advertiser reports that the former Picture House in Blairgowrie is to be demolished for flats; although the article seems to suggest the frontage will be kept, the planning application online here seems to show the whole site being cleared. The Edinburgh Evening News reports that plans to extend the stage and rehearsal space of the Festival Theatre are set to go ahead; details here and here. 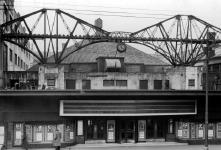 The recent Glasgow Film Festival highlighted some of Glasgow's old cinemas by showing short films and clips in or on them; details here and reported on here. The database and other pages have been updated, thanks to new info from David Thom, Pete Naples, Robert Clark, Ian Grant, Trevor Griffiths, Mervyn Gould and others. A gallery of photos of the demolition of the former Regal, Paisley can be seen on Flickr here, thanks to HistoricalPaisley. Some other images showing the demolition work even further along are also on PaisleyPicture's Flickr page here. The weekend of 7/8 March 2008 will see Edinburgh's favourite cinema marking 60 years since it opened as the Cameo (and 95 years as a cinema). To celebrate, on Saturday 7 March it will screen classic silent double bill featuring Buster Keaton, featuring live piano accompaniment. On the Sunday, an archive print of LA SYMPHONIE PASTORALE will be screened which was the very first film shown at the opening of The Cameo in 1949. The screening will be preceded by some interesting Cameo-related archive material onscreen, and a display of photos and cuttings about the cinema will be on display in the bar and foyer. The plans for the gutting of the auditorium of the Edinburgh Odeon to convert it into a boutique hotel were passed by the local council (planning report here); however the final OK has yet to be given by Historic Scotland. While HS legally have 28 days from the date of the council decision to decide if they want to do this, they wrote to the council just before Christmas to request extra time to make their determination, and to ensure that no binding decision is issued prior to that happening. Coverage in the Evening News here. In related news, the plans to demolish most of the Glasgow Odeon and replace the auditorium with an eight-storey glass office block are now officially on hold thanks to the credit crunch; this may also have implications for the Edinburgh redevelopment plans, as the same company - Duddingston House Properties - is behind both schemes. Details on the Architecture Scotland website here. A fire in October damaged the former State cinema in Leith; this is currently empty awaiting conversion to flats behind a retained facade. The fire in the foyer block does not appear to have caused too much damage, as far as can be seen from an external inspection. Details in the Evening News. A revised version of Historic Scotland’s new Scottish Historic Environment Policy - incorporating guidance on listed buildings and listed building consent - can be seen online here. The nightclub Jumpin Jaks, which is in the upper half of the former Capitol cinema in Union Street, Aberdeen, has closed. The Chicago Rock pub in the former stalls and screen area is still open, but the former cinema cafe area is also now empty. Photos from urban explorers show that some of the original light fittings are now smashed, and that the roof is apparently in poor condition and may be leaking already. News reports suggest that a new 10 screen multiplex cinema, operated by Vue, will be part of expansion work scheduled to take place at Glasgow’s Buchanan Galleries shopping centre. Work is scheduled to start in 2010. Details here and here. Cromarty Film Festival organisers held a showing of the film ‘The Maggie’ on a ferry between Cromarty and Nigg, according to the BBC News website. Plans are set to be lodged to establish a temporary cinema in Fort William – as a precursor to the potential re-opening of the town's picture house at Cameron Square, which closed suddenly in September 2006. Details here. A selection of archive photos of Falkirk cinemas can be seen on the local council website here. Thanks to Joanne Hynd for the link. Redevelopment of the site of the former Palace in Burntisland is going ahead, according to this report. No word yet on possible re-use of the stained glass windows rescued from the building prior to demolition. The Perthshire Advertiser reports that plans for a large multi-use site on the outskirts of Perth could include a multiplex cinema. This would obviously impact on the 9-screen Playhouse in the centre of town. Demolition work has started at the unlisted former Regal in Paisley (CJ McNair, 1934). Michael Fediginan has a gallery of pictures monitoring the building here. The Evening Times reports that there was panic when a snake was reported to be loose in Glasgow’s CineWorld. 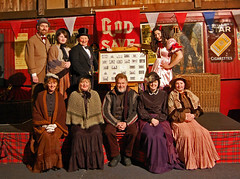 The Gaiety Theatre in Ayr is to close in January 2009 while the local council decides what to do with it, and whether it can afford the funds to refurbish it. This is despite an offer by the owners of the Glasgow Pavilion to take over the running of the theatre as a going concern. The Theatres Trust have expressed concern. Details in The Herald. Some of the most remote parts of Scotland will benefit from investment in cinema screening facilities. Eight venues will share more than £200,000 from Scottish Screen to install digital projection equipment. These include new cinemas for the village of Langholm, and Isle of Whithorn, as well as new equipment for the Newton Stewart cinema, Robert Burns Centre Dumfries, Highland Theatre, Oban and the cinema in Fort William. Details in The Times. A local youth group are campaigning for a new cinema to be built on a brownfield site near the centre of Cumbernauld. The original Cumbernauld cinema, built in 1978 as a two screen cinema, and a condition of planning for the bingo hall next door, remains closed and mothballed, having shut in the early 1980s. The former 2-screen Allanpark cinema in Stirling could be converted for church use, under plans submitted by the Destiny Church group. The Allanpark opened in 1938, and was divided with bingo in the former stalls, and a two screen cinema in the former balcony in 1977. The cinema closed earlier in 2008, when a new Vue multiplex opened elsewhere in the city. The Destiny Group owns two former cinemas in Edinburgh - the former New Tivoli in Edinburgh, and the Central in Leith. The Stornoway Gazette had a behind the scenes feature at the An Lanntair cinema here. Plans are well advanced to test using Edinburgh’s Festival Theatre as a venue for red-carpet premieres for the Edinburgh Film Festival. The Festival has been without a suitable venue since the Clerk Street Odeon closed. Details here. Also thanks to the following for additional information and reporting: Mervyn Gould, Jay Saint, Graham Kelly, Joanne Hynd, Bill Mather, Scott McCutcheon, Alan Bunting, Ross McNeillie, Michael Fediginan Olive Sharpe, Kenneth Duncan,Trevor Griffiths, and Alex Banks.